Working in Brighton, I’ve always enjoyed the variety and number of networking events and casual meet-ups that are available. But wherever I go, I rarely meet other writers. So, after chatting to Ellen about it, we decided to set something up. Do you write for a living? If you’re a professional writer, or someone who wants to be a professional writer (like a journalist, copywriter, novelist, poet, travel writer, proofreader or anything else) or just someone who would like to meet writers, come along! WriteClub is a very relaxed, informal association that consists of drinking coffee and chatting. You can come along to get ideas or support, to find inspiration or tips or to just get away from the laptop and meet other writers working in your area. What do you need? Nothing. Just yourself and some change for a coffee. So Ellen and I will be in Cafe Delice, 24 North Road, on Tuesday 29 September at 8:30 (am). The meeting will last as long as it lasts, but feel free to drop in and leave whenever it’s convenient. 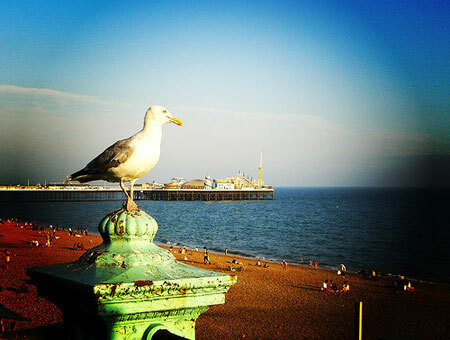 Brighton is a great place to work, especially if you’re a freelancer or in any way connected to the geek community. There are lots of regular networking groups and loads of opportunities to get involved with interesting projects. One of these networking groups is the Farm. Aimed at connecting and supporting freelancers and small businesses, the Farm meets weekly at a Brighton pub. I started going a few weeks ago and have now been invited to join the mailing list, and was given a rather fetching profile on the Farm website. So if you’re working in new media and want to do a bit of low-key, super-relaxed networking with Brighton’s friendliest bunch of geeks, get on down to the Farm.